Ready, Set, Go! – Hello Korea ! , originally uploaded by Almost-Human. Y me to Ansan to exchange my driver’s license today! Woo hoo! Yayy! 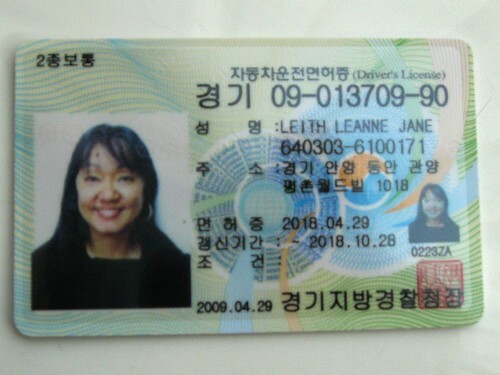 So even though my U.S. license expires next year, the Korean government realizes that it’s nothing to renew it. Therefore, this license is good for nine years. All I had to do was give them my U.S. license and show them my passport and alien registration card, give them (3) 2cm. x 3 cm. photos, (they also had a photo booth there for 5,000 won) give them 5,000 won and purchase another 6,000 won stamp and take an eye exam. I just have to return to Ansan to get the original back when I leave Korea. Now, I can rent a car whenever I want and drive all over Korea. All the rules of driving are the same as in the states, and the only difference is turning left has its own traffic light, so traffic continuing forward must sit through another red and also a yellow light during that time. Wow, it seems easy, of course if we don’t talk about the language. Would it be also easy to renew your driver license in the US? Something that I would like to do is to travel by car in different places of Korea, but I think I would be scared to drive in Seoul. And I’m not very good at parallel parking because I didn’t get the opportunity to practice it alot, so I would have problem. Renewal of a license in the U.S. is as easy as showing up and paying some money, getting a new photo, and maybe at the most having another vision test. I’m not afraid to drive there, as the driving is actually very similar to America. But should something go wrong, then I don’t know what would happen. But it’s the same for anyone who rents a car in a foreign country. It’s just a chance I’ll have to take if I want to go beyond where mass transit can take me. As for parallel parking, learning that is a problem for everyone. A car you don’t care about helps! It’s really a problem when come to parallel parking where there are poles for you to park when you are in the learning centre but things can be easy if you practice a few more times. Practice makes perfect. For Singapore it’s driving seat is on the right. What about korea? Car Rental Singapore – From as low as $40 a day. driver’s seat is on the left, just like in the U.S.